I came, I saw, and I ate at SM Megamall's Mega Food Sale this afternoon. And aside from getting a great deal from one in over a hundred of dining establishments on sale, my adventurous taste buds also got to explore another cuisine I haven't been acquainted to that much, Middle Eastern and Indian fare which The Kebab Factory generously offers. Being a lover of the famous Chinese, Japanese and Filipino dishes, I haven't had the chance to immerse myself in the gustatory delights of the Middle East, as well as India's. I honestly have gone to only one similar restaurant, so I was definitely excited to try out the dishes at The Kebab Factory, conveniently located in Mega Atrium's 2nd floor. Although I don't know a lot about India and the Middle East, I didn't feel even a hint of intimidation at The Kebab Factory. The interior for one is very cozy and relaxing despite being sophisticated. And for someone new to Mediterranean cuisine, the restaurant and all its staff were actually very welcoming and helpful in answering all my inquiries. Food comes aplenty in The Kebab Factory. From meal starters, kebabs, tikka and tandoori, to curries, breads and desserts, the resto has a wide selection of food items to choose from. However, for the Mega Food Sale, these promos are given the spotlight. All three of these promo sets are great value for money, and will luckily be staying even after SM Megamall's Mega Food Sale. However, better try it now than later. 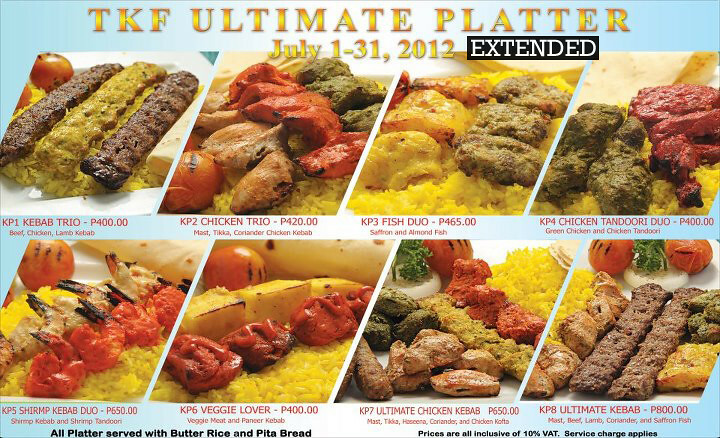 And since I ate solo, I opted to get an item from the TKF Ultimate Platter for a heavy lunch. 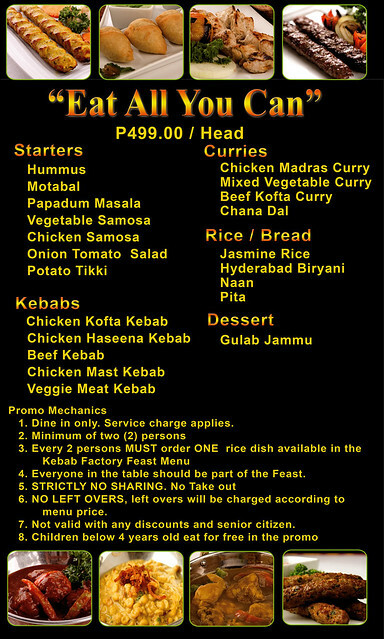 For my ultimate platter, I've chosen to go with the Kebab Trio (P400), a big plate of not one, not two, but three mouthwatering skewers of kebabs in beef, chicken and lamb, served with butter rice, pita bread and some vegetables on the side. As a small girl with a surprisingly big appetite, I hate to admit that I've lost to this hearty plate of meaty goodness. As much as I want to finish the whole thing up, I just can't force myself since the serving is really huge! And taste-wise, this platter got every good thing going. All three kebabs were so meaty and so flavorful. However, if I'd pick a favorite, then I choose the lamb since it was the most succulent among the three. 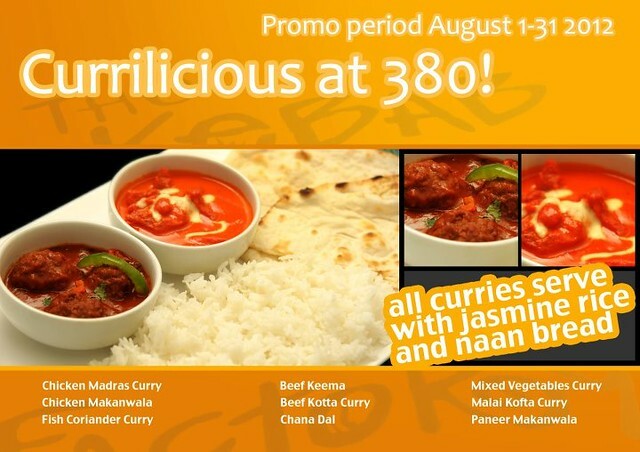 Don't get me wrong though, the beef is quite as tender and tasty, while the chicken has a nice curry kick to it. This may be trivial to some, but it was very important for me. Yes, the dips. 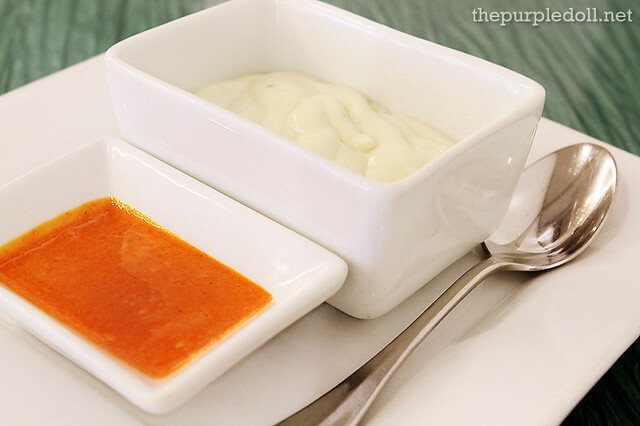 No matter how good a serving of kebab is, a dollop of dip can even take it up a notch higher. And for my case, the Yogurt Garlic Dip made my meal even more memorable with its beautiful blend of salty, garlicky and tangy sharpness. Spicy food lovers can also shout hooray as the Chili Dip is one hot item! Even a little bit can already give you a strong kick. Of course, I wouldn't leave The Kebab Factory without even trying any of the desserts. So for the afternoon, I had myself one of their specialties, the Rose Kulfi (P150) which is a home-made ice cream with purée made of cardamon and rose. 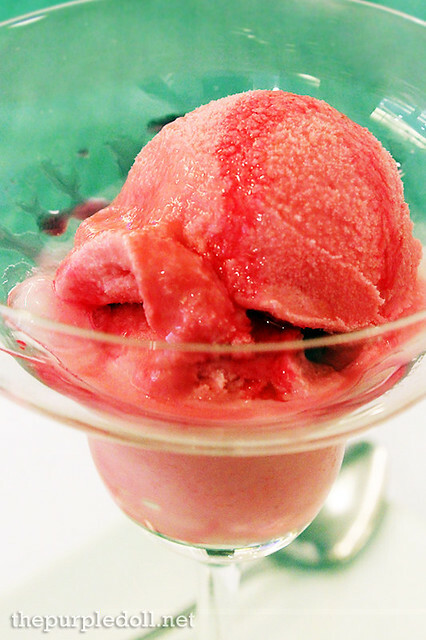 I may not know a lot bout aphrodisiacs, but this ice cream got me spellbound upon first sight. The color is just so beautiful, and the light, refreshing smell is so enticing. Upon tasting it though, the Rose Kulfi was not what I expected. Don't get me wrong, it did have that distinct rose flavor which I love. However, it was just too sweet for my palate. I'm not sure if they had too much sugar or syrup for this batch. 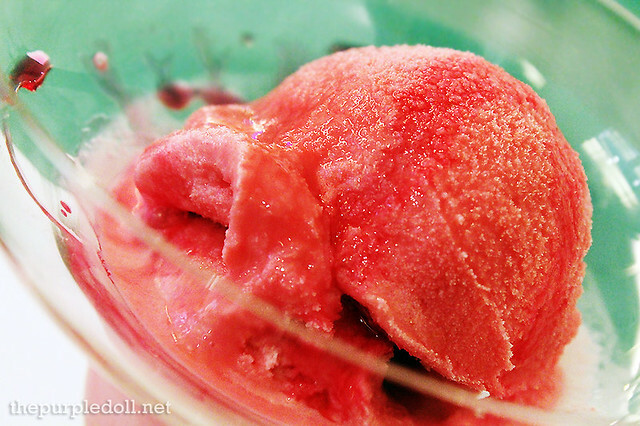 But if the sweetness was toned down a bit, this will no doubt make it to one of my favorite ice creams. 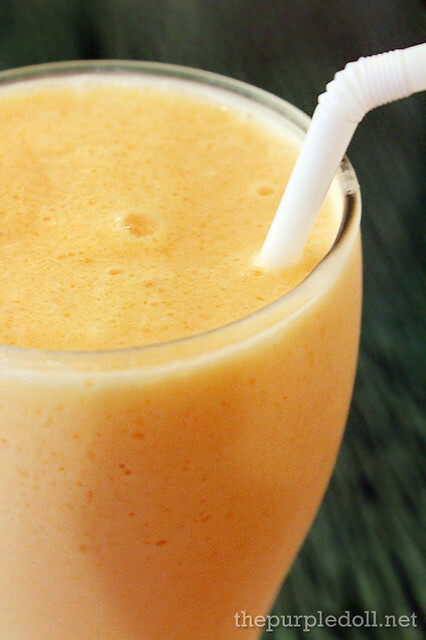 As for my choice of beverage for the afternoon, I decided to go with Melon Lassi (P135), a refreshing concoction of sweet melon, and salty and tangy lassi -- a yogurt-based drink popular in India. To be honest, I'm not much of a yogurt fan, but The Kebab Factory's lassi was an exception. I loved it to bits and will definitely order it again on my next visit. After a day of pigging out in The Kebab Factory, I've gained a new-found interest on Middle Eastern and Indian cuisines, both of which have distinct flavors which fortunately tickled my palate in the right ways. And with a courteous and prompt service, reasonable pricing, a relaxing restaurant ambiance and even its own toilet, I'm very positive that The Kebab Factory hasn't seen the last of me. I love Kebab Factory! I should have tried their desserts too but got really full when we tried the Chicken Mast Kebab. Thumbs up too for the garlic dip! Having been leaving in the Middle East for more than 10 years , where kebab is one of the popular dish,I learned to love it. There ia one Pakistani friend that makes a delicious kebab ,sadly I never had the chance to ask for his recipe. I've never tried Middle Eastern food. But since you recommended it, I'm gonna check this out. 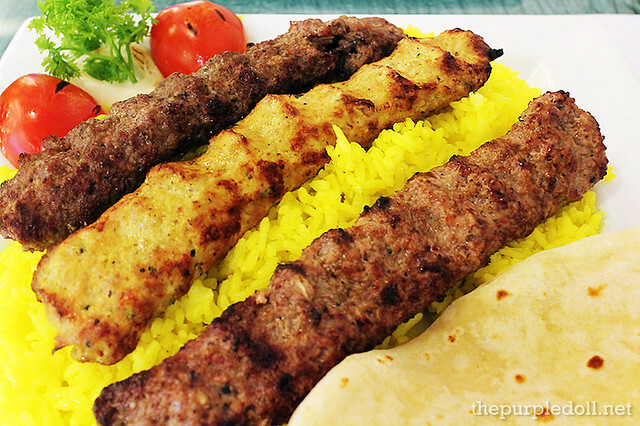 Aside from Chinese dishes which I love, Persian food is also our weakness! We can eat kebabs everyday! 4/5! We are quite happy at the simple Mr. Kebab, I think we should really really try Kebab Factory sometime. Thanks for the review, and the photos! I haven't tried Mr. Kebab yet.. :D Maybe next time, I'll try that one naman.. ;) Thanks! I remembered a rose drink I ordered in Kozui, it smelled good but it tasted different ; p I have to try lamb kebab. Your photos look so appetizing! As far as I know the origin of kebab lie in the short supply of cooking fuel. Well I must try this KEBAB RECIPE. 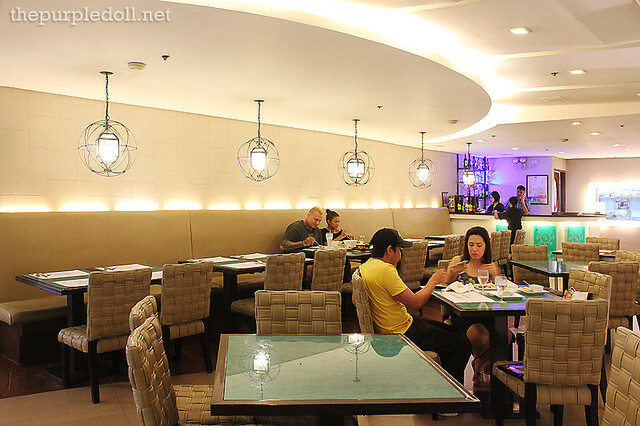 love the ambiance and the trio you ordered looks mouthwatering. :) makadaan nga. Haven't tried this establishment but I always love me some kebab! :> Will keep this in mind. Looks really good, Sumi! Thanks for sharing this. The hubby doesn't want indian foods; pero, I do! hahaha!! I'd love to try this sis! Yummy food, want to experience the taste. We love kebab too. Is this better than Arya's? wow looks yummy! I think the serving was really more than enough to feed a hungry tummy. chicken kebab's are my fav. Oh I miss kebab! I first knew and had kebab when I was in Bahrain. Oh my, my friends and I will love it there for sure! Must visit soon! I really wanted to go there last Sunday but knowing the wife who is very picky with her food, we have to choose the one accross (Yabu). love the yogurt garlic dip and the kebab trio! !